In recent years, when an Australian men’s squad has been announced, the custom has been for a clickbait “You’ll never believe who got picked!” headline to pop up. But it was just the opposite for the 15 selected on Monday to defend the World Cup that Australia claimed four years ago. It was altogether as expected – boring, even, and controversial only for a couple desperately unlucky to miss out. That reflects the fact that the men in canary yellow have, just in time, got their act together for the tournament, which begins on 30 May and will be held in England and Wales. Five weeks ago, Australia were on a run of 22 defeats in 26 one-day internationals. Then a stunning turnaround in India saw off their formidable hosts 3-2. Next came Pakistan. 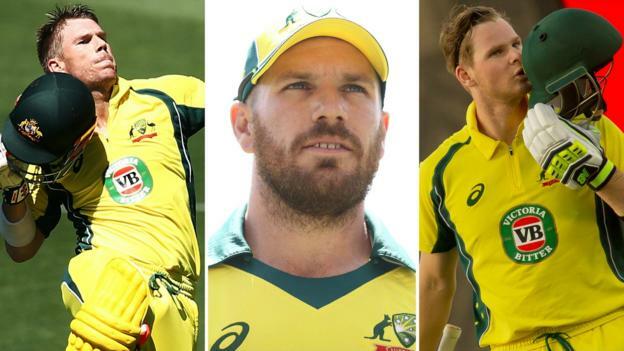 Aaron Finch’s side dispatched them 5-0 in the fashion of generations past – and not that of an Australian team that spent 12 months reeling after the sandpaper saga. So, the naughty boys are back? Just as planned, Steve Smith and David Warner will be back in the national uniform to help defend the title they were integral to securing four years ago. Former captain Smith will arrive underdone after elbow surgery at the start of the year and with just one half-century in the Indian Premier League so far. While his limited-overs form did take a negative turn in the year preceding his ban, his experience – not least in the World Cup, where he made two centuries in 2015 – was enough to guarantee his return. For Warner, there are no doubts – he is just too good. He has gone beyond 50 in five of his seven IPL games for Sunrisers Hyderabad this season, including a masterful century against Royal Challengers Bangalore. That he has the most singles and twos in the competition, as well as the most runs overall, reinforce what a vastly different and better batsman he is than the man who boshed his way to fame a decade ago. According to Trevor Hohns, chairman of selectors, the pair “know the environment they’re stepping into, which is completely different to when they left”. That may be so. But the England fans won’t let them forget their most recent ODI outing for Australia. Didn’t Australia get smashed 5-0 in England last summer? Yes. And it was brutal. Especially the day they conceded a world record 482 in the third ODI at Trent Bridge. But it is worth noting that those were the first matches of any kind since they became a worldwide laughing stock in Cape Town. Just as for a procrastinating student, deadlines inspire action. The approaching World Cup sparked a burst of activity at the start of 2019 to find a credible combination. Sure enough, they have. Warner’s readmission creates a bizarre love triangle at the top of the list after incumbent openers Finch and Usman Khawaja dominated in the recent winning streak. Finch was under real pressure before rattling off more runs in a five-game ODI series than anyone ever has. As for Khawaja, with two tons and five scores between 50 and 98 in India and the UAE, he is in the middle of a purple patch close to the one he enjoyed across the 2015-16 southern summer where he would have been the first batsman picked for Earth against Mars. Will this duo be split up to accommodate Warner, who has 14 centuries as an ODI opener? Hohns says that’s up to the captain and Justin Langer, the coach, to decide. For Finch’s part, he wants to retain a right/left combination. It’s the very definition of a good problem to have. On the available evidence of recent white-ball seasons in England, the team that wins this competition will have to spin the ball with enthusiasm. In the 2015 competition at home, Australia deployed part-timer Glenn Maxwell as their sole tweaker. This time, by contrast, he will have Adam Zampa and Nathan Lyon for company. Leg-spinner Zampa took more wickets than any ODI bowler in 2016 before losing his way – and his place – in 2017. An aggressive line and consistent length since his return have delivered both wickets and economy, while Lyon’s 370 wickets for Australia across all formats suggest he has the experience for the pressure situations. That means Maxwell, one of Australia’s snazziest movers with the bat, can continue his good form, having enjoyed success in all three of Australia’s white-ball series wins in 2019. He remains a polarising player but at age 30, there’s never been a better time to build on the promise he has long shown. Who was unlucky to miss out? At Mohali in March, where this turnaround occurred, Peter Handscomb made his maiden ODI ton as Australia chased 359 when they had no right to. When he fell, Ashton Turner took over to clobber 84 from 43 balls to finish the job. Neither have made the cut, with Smith preferred to take up Handscomb’s accumulation role. The call is doubly puzzling because it denies the Australians the chance to use Handscomb as a wicketkeeper in the event that Alex Carey – still far from established with the bat – falls away at the wrong time. But the selectors have run this risk. Both Handscomb and Josh Hazlewood – the quick left out of a rapid attack as he returns from injury – will be in the country with the Australia A squad during the tournament. If Carey fractures a finger or a bowler breaks down, they could be drafted in. They’re going to win it again, aren’t they? Well, they believe they can. Maybe that will trip up against a spin-friendly attack. Maybe they will run into one of the favourites – namely England or India – who have been gearing up for this for two years. But confidence is often the difference between boom and bust. Whether it is deserved or otherwise, Finch’s side have plenty of it. What they can do with it will make entertaining viewing.